Sustainable buildings are designed in a way that uses available resources efficiently and in a responsible manner, balancing environmental, societal and economic impacts to meet the design intents of today while considering future effects. Sustainable buildings are designed to be energy efficient, water efficient and resource efficient. Technical Note #48 from Brick Industry Association. NetZeroEnergy (NZE) is an important issue today in the building construction industry. It is not a lofty goal, but rather, is a real and achievable solution that can greatly reduce, or in some cases, eliminate energy consumption in new and retrofitted structures. NetZeroEnergy is the result of careful planning, so that the total energy consumed is offset by renewable energy onsite. Existing facilities, depending on when they were built, have somewhat limited and expensive solutions to the upgrading of existing insulation barriers against severe weather conditions. On the other hand, new buildings and new additions can be constructed with 21st Century “user and taxpayer friendly” standards which are dramatically more energy and cost efficient. Abstract: This Technical Note presents current U.S. building and energy code criteria applicable to the design of wall assembly portions of residential structures of three stories or fewer. A brief description of compliance paths is provided, along with a comparison of code requirements to widely used measures of residential energy performance. Read about how economy and energy efficiency was considered for using brick over steel studs for an upcoming very large school project. An architectural firm was particularly interested in building a highly efficient exterior envelope system, which could qualify them for a LEEDS Program, and earn them additional credits or financial assistance from the State of Illinois. Steel stud wall systems face several design challenges; from meeting structural requirements to effective insulation values. Current typical conventional steel stud construction is as follows: interior gypsum, optional vapor barrier, 4”-6” steel studs filled with R-11 to R-19 fiberglass batt insulation, exterior gypsum board, air barrier, air space, and a brick exterior. Two issues are apparent in this system; R-value effectiveness and moisture in the system. Sustainability has risen to the top of the concerns for every industry. Masonry experts have done an excellent job promoting the sustainable characteristics of masonry. As structural engineers, we try to incorporate sustainability into our designs. Rethinking Sustainability & Economy of Reinforced Masonry. In the development of standards, decisions are made that take on a life of their own. This leads to empirical and prescriptive criteria that are often difficult to change even though there is little technical information to support those criteria. The early use of cavity walls in this country was limited primarily to exterior load-bearing walls in low rise construction. In the 1940s, designers began to recognize the advantages of cavity walls in high-rise buildings. Today, masonry cavity walls are the preferred wall system and are used extensively throughout the United States in all types of buildings. The primary reasons for their popularity are: superior resistance to rain penetration, excellent thermal properties, excellent resistance to sound transmission and high resistance to fire. This article from The Seattle Times was included in our May newsletter. 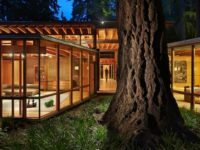 It’s an interesting story about how trees were worked into the layout of a new home. It incorporates nature into an open floor plan and has beautiful design features. Although most of the home is constructed of wood, there are elements of masonry used to add structural support. Find out how it was done!